Along with the dietary changes we’ve made in the past year have come some happy consequences, above and beyond what we were expecting. Brett suffered from a persistent cough the past several years, more annoying than anything problematic. He talked with his doctors about it over the years, but all felt it was a side effect of one of the medications he took, and they recommended he take over-the-counter allergy medication to relieve the cough as much as possible. Along with cough drops the OTC medication helped somewhat, but the cough still lingered. However, when we removed dairy (mostly ice cream and cheese) from our diet for YaYu, who is lactose intolerant, Brett’s cough disappeared along with several other problems he was experiencing. It turns out he was allergic to milk! Not once in all these years was that ever considered as a possible cause for his cough. He still eats a small amount of cheese, but only a couple of times a week, and that’s it for dairy these days. What a happy consequence it was to finally solve the riddle of the cough, and all because of a simple change to diet. At the end of last year I developed a fairly severe case of GERD (GastroEsophageal Reflux Disease). It came on quickly, and got so bad that it was waking me up at night. My doctor prescribed medication, but at the same time also told me to ditch the carbs/starches as I was also complaining about my weight gain – even though I exercised, and measured all my portions, no matter what I did I still added pounds each month. Even after starting the medication, I still suffered from the GERD each night when the medication wore off. But, within a week or two of no longer eating starches, the acid reflux disappeared completely, even at night, and even on the occasional day when I forgot to take the medication – a happy consequence of no longer eating starches. I see the doctor next month and am going to ask if I can wean myself off the medication I’m still taking. Fingers are crossed! 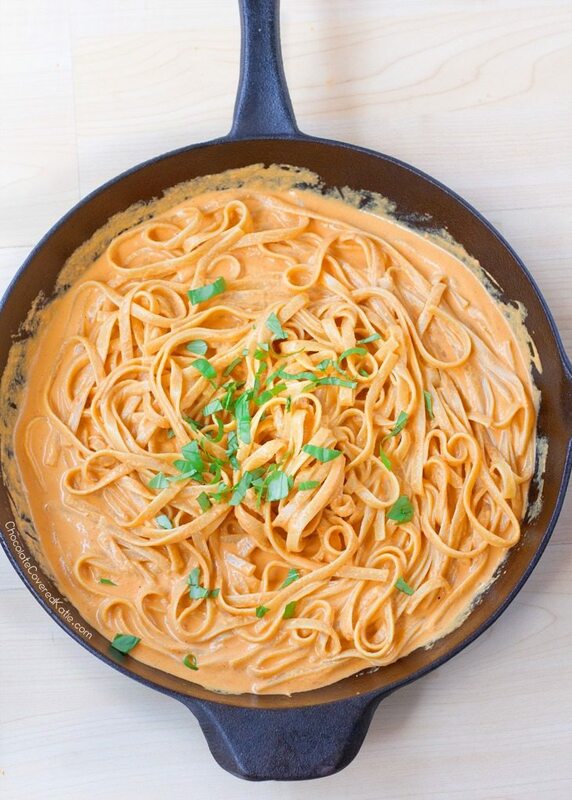 The girls want to make pasta on Thursday which gives me an excuse to make the red pepper alfredo sauce (I always make double so I get leftovers). They’ve also agreed to help cook other dishes so that I don’t have to stand over the hot stove. I do the prep, and they do the hot stuff – works for me! This week at the farmers’ market we’ll be getting more cucumbers, lots of fresh tomatoes (for the Caprese skillet eggs), papayas, zucchini and onions. We also need more limes as it’s mojito and gin & tonic season once again, and I’d like to get some fresh mangoes if I can find some affordable ones. Wondering if you get spaghetti squash at Costco when they are in season. My mother in law could not eat wheat. She learned to purchase a bunch of spaghetti squash and use that for her pasta. The other thing was she “spiraled” zucchini and other squashes for her pasta as well. Little changes help. We let go of bread, and we both feel better. Congrats on slowly figuring out what works, and does not work, for you. I have occasionally seen spaghetti squash at our Costco, and just told Brett last week that the next time I see it I am going to get some. I am also *this close* to buying a spiralizer to make zucchini noodles – I love zucchini, and it would let me have noodles when the others are having pasta. I’m surprised I don’t miss starches more, but I feel so much better now. My occasional piece of Japanese raisin bread seems to be enough, or a small KitKat after dinner. Sadly, both will be gone by the end of next month so I’ll be completely starch-less. I’ve found that dairy upsets my system more as I age, and hard cheese less so because it has little or not lactose. Also, I have a very clear connection between carbs and heartburn that has become worse with age (ain’t it grand?). I will second the spaghetti squash as pasta idea. I love it. Dairy doesn’t upset my stomach, nor did it upset Brett’s, but neither of us enjoy it much these days except for cheese. Every month we allow ourselves two large pieces of cheese from Costco – we have a lot of fun decided which variety we will get (we still had extra-sharp white cheddar and gouda from last month, so bought brie this month). Carbs/starches seemed to be what was causing my heartburn late last year and earlier this year. I cannot believe how much better I feel now that they are out of my diet, so good that I have not been tempted to try and add them back in. The one slice of raisin bread is my one indulgence. I am going to start doing a better check at Costco and see if I can find spaghetti squash. I’ve also seen it a couple of times at the farmers’ market, so will be looking more carefully there as well. Like you and many others, I’m doing my best to reduce and eliminate refined and white carbohydrates as much as possible. I actually like spiralized carrots better than spiralized zucchini for a pasta substitute, the zucchini noodles just seemed watery and insubstantial when I tried that. I recently found several brands of pasta made 100% from either black or garbanzo beans, and several other made from 100% red lentils, and those have been awesome for being able to make a dinner that both the hubby and I can enjoy without any extra work. Thanks for the tips about the different kinds of noodles. I have heard about edamame noodles, but they’re very expensive – I will have to check and see if the lentil or bean noodles are more affordable. I think I’m going to have to get a spiralizer. Zucchini noodles sound fantastic, but the carrot noodles sound very, very good too. So glad to read that you are enjoying the blog! The kind I like best, Banza garbanzo bean pasta, was about $4 on sale for an 8 oz box. Trader Joe’s red lentil sedanini (kind of like penne) is more reasonable, maybe $3 for a 12 oz bag. If everyone else in your family is happy to eat regular pasta while you have alterna-pasta, maybe it would be affordable enough to at least try a couple kinds to see if you like any. That being said, before I discovered all of these bean / lentil pastas and before I had a spiralizer, I just shredded red or green cabbage and onions, and steamed it all in the microwave until cooked but still a little crunchy. That always made an excellent vehicle for any kind of pasta sauce and was pretty darn satisfying at least to me. I have no doubt that between a spiralizer, spaghetti squash, and alterna-pasta, that you will find an alternative to regular pasta that you will really enjoy! Thank you for the tips on brands – I am going to give them a try. I broke my no spending rule yesterday and bought a spiralizer! I’m so glad to hear that the changes in your diet are having a positive impact on both your and Brett’s health. I have also seen improvements since giving up or drastically cutting down on refined carbs. After trying for years, I have finally succeeded in losing 30 pounds, and that has really helped my back problems. Am getting close to my goal weight! Do you find it easier to give up something completely than to have something in moderation? (Writer Gretchen Rubin describes people as being either “abstainers” or “moderators.”) I am in the abstainer camp, so it works better for me to have bright-line rules — it eliminates a lot of agonizing and willpower-sapping decisionmaking. I highly recommend spiralizers. I bought one and use it often to make zucchini “zoodles” as a substitute for pasta. Check out the many blogs and websites with spiralizer recipes. Some people are fans of shirataki noodles as a pasta substitute, but they are expensive and I don’t like the texture. I’m happy with the zoodles. Congratulations on getting close to your goal weight! From (lots of) experience I know how difficult losing is, as well as having to accept that there’s no easy fix – it’s something we have to remain vigilant about. I think losing the refined carbs, starches, etc. has been a huge step in the right direction for me – I still almost can’t believe how my body has responded, and the amount I have lost. Under the old “well, you can have anything, just in moderation” method I was gaining every month, no matter how little I ate. I’m happiest though about finding the answer to what was causing Brett’s cough – he and the doctors had tried so many things, and the cough was not only annoying him, but the rest of us as well. I’ve decided to order a spiralizer. There are some affordable ones on Amazon and I’m going to give zoodles a try. BTW, I’ve also tried the shirataki noodles – they’re OK in cold salads and sukiyaki, but I don’t care for them as pasta. I have found that dairy products bless me with sinus infections and also a cough. From the research I’ve done it seems to be a sensitivity to the casein protein. As a former dairy farmer’s daughter, I sure miss cheese, but I have to abstain because I just feel better. I have used zucchini in lasagne rather than pasta and I also use sweet potatoes or squash when I make sloppy joes or pasta sauce. Glad you and Brett are feeling better these days! We did not know that about the casein protein – interesting. Brett also suffered from sinus infections, so it sounds like he had something similar to what you experienced. We really missed dairy at first, especially cheese (always my favorite department in a food store) but the longer we’ve done without the less we miss it. Brett has soy milk on his oatmeal in the morning, and has an occasional piece of cheese which seem to satisfy him. I eat cheese at lunch 3-4 days a week, and have yogurt a couple of mornings for breakfast, but otherwise I’m pretty much dairy free too. Really looking forward to getting my spiralizer and adding ‘zoodles’ to my meals. Zucchini is available here year-round, is inexpensive, and we all like it so it should hopefully work out well.